It's no longer a secret that the latest versions of iMovie for Mac and iMovie for iOS are both capable of handling 4K video editing (3840 x 2160). That's really a good news for 4K video buffs. Yet, does this mean you can put 4K video of any video format in iMovie for 4K editing? I'm afraid not. If you are recording 4K video in XAVC S using MP4 container format or via iPhone 6s/Plus 4K video recording feature, congratulations, you're able to smoothly import 4K to iMovie for video editing. In case you get the 4K video from your Sony, Panasonic, Canon, or JVC HD camcorder formatted with MOD, TOD, MTS, M2TS, etc., sorry to tell you though iMovie for Mac or iOS accepts the 4K Ultra HD resolution, iMovie still can't work with those HD camcorder video formats, for which are excluded from the iMovie compatible format list. Unable to Import 4K Videos to iMovie for Editing? Solved Here! To ensure successfully importing 4K to iMovie no matter what kind of video formats, what you need to do is to resort to a iMovie 4K video converter to convert 4K 60fps video to iMovie friendly video formats. Here the award-winning MacX Video Converter Pro cut the buck at this point, letting you process/convert 4K (60fps) video to iMovie MP4 MOV MPEG-2 AVCHD, and other compatible formats for seamless 4K video importation without any compatibility issue. Moreover, this 4K video converter also performs great as a 4K video compressor to compress 4K to 1080P/720P with even smaller file size if you wish. Yet a 4K video editor as well to reduce 4K MP4 file size, cut MP4 video files, crop black bar, add SRT subtitles, add watermarks and so on. After free download this 4K for iMovie converter on Mac, run it and click "Add File" to load the 4K video files you want to convert for iMovie. Opt for the output format you desire. If you want to convert your 4K UHD video to MP4 file, choose "to MP4" as your output format. Supposing you wanna edit 4K in Final Cut Pro X or Adobe Premiere, you're also allowed to convert 4K to FCP X, Adobe Premiere video formats. Note: If you only want to do so basic adjustment of your 4K videos, you do not have to move to iMovie. This 4K MP4 video editor can kill two birds at once, not only allowing you to edit 4K videos but also convert 4K videos to iMovie compatible formats. Followed by the mouse click on "RUN" button to start converting 4K to iMovie MP4 format on Mac OS X. This iMovie 4K converter will automatically helps you finish conversion, and you can also compress 4K to 1080p/720p by adjusting the video resolution like the picture shown on the right side. 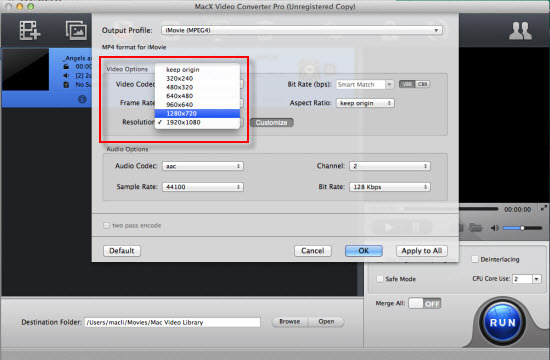 Related reading: How to import various formats videos to iMovie? After hassle-free converting 4K to iMovie, you can eventually import 4K VR videos for further editing on iMovie for Mac or iMovie for iOS. Certainly, you also have the option to start a 4K editing on your iPhone, continue working on your iPad with iMovie for iOS, and then add the final 4K touches on your Mac in iMovie for Mac version. And with iMovie Theater, all your finished 4K video clips appear on all your iOS Apple devices. So you'll always be the star of the show. Okay, below shows you how to edit 4K in iMovie for Mac. Find out the iMovie Event Library to export 4K video from camera or computer, and if you haven't the 4K video clips stored on computer, you can also utilize MacX Video Converter Pro to get 4K video downloaded free from YouTube, Facebook, Dailymotion, Vimeo, etc. (300+ sites). Note: Camera 4K Import: This opens the window for handling 4K video imports from your camcorder or webcam. To do this, use File Menu > Import > Movies. Prior to edit 4K video in iMovie, you'd better have a basic understanding about iMovie editing tools. If your 4K video gets huge file size, follow to compress 4K videos in iMovie before exporting. Arrow: This is the basic tool to have enabled so you can select and move 4K video clips. Favorite Tool: designed to mark a select 4K video clip as a "Favorite" which then will be indicated by a green line under your 4K ultra HD clip in the Events Browser. It's a sound method to remind you which clip is good and ought to be used in your raw 4K clips. You can then opt for View Menu > Favorites or View Menu > Favorites and Unmarked to filter your raw clips. Unmark Tool: disable the Favorite or Rejected indicator from a clip. Reject Tool: Use this to mark a select 4K clip as a "Reject" which then will be indicated by a red line under your clip in the Events Browser, which is a prompter to prevent you from accidentally using them. You can then choose View Menu > Favorites or View Menu > Favorites and Unmarked to only show the raw 4K clips that are usable. Honestly speaking, there are scads of video editing features in iMovie, which are supposed to be illustrated with a large amount of time. 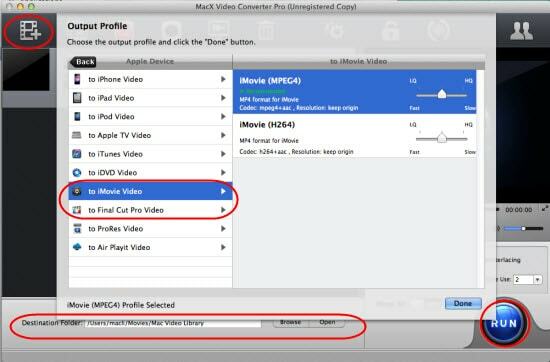 So if you are interested in more editing features of iMovie, please consult to the professional iMovie instruction manual for detail explaination. 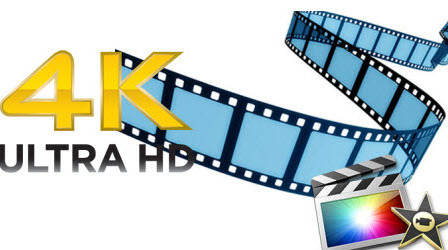 What's the best 4K UHD videos codec format, MP4 with HEVC codec, or MKV with HEVC, or VP9? What's the best format for 4K Ultra HD 2160p TV? Find detailed answers here. If you can't import AVI to iMovie for editing on Mac OS X, read this guide to see how to convert AVI to iMovie supported format and import AVI to iMovie (iMovie 11) easily. 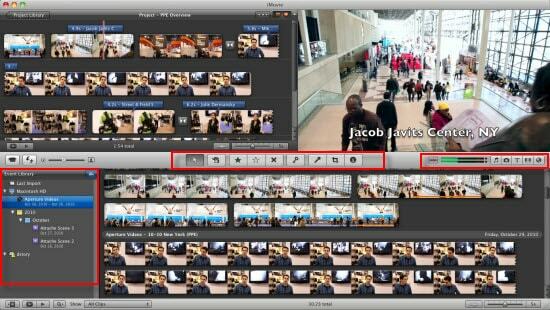 Editing videos on Mac can be the easiest thing if you got a right video editor for Mac. This article lists 8 best Mac video editing software, helping you edit videos on macOS like a pro. MacX Video Converter Pro is the best all-in-one tool for 4K 60fps video; convert 4K video to 1080p, 720p, iMovie accepted video formats; free download 4K 60fps video from 300+ video sites and convert 4K video to iPhone iPad Android devices no quality loss. We enlist 2016 to 2018 top 3 4k video editor software for Mac and Windows. Why upscale HD 1080p to 4K UHD? How does the upscaling work? Learn to compress 4K videos with high compression ratio.